A musical interlude during the Festival, at our favourite intimate venue. Georgia Lewis, hailed as "the best voice to emerge from the English folk scene in recent years", is a consummate multi-instrumentalist with a fresh approach to folksong. She is joined by longtime collaborator Rowan Piggott, a fiddle-player and songwriter with a "deep understanding and feel for tradition". 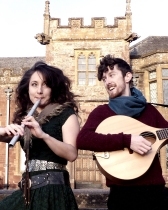 Together they perform compelling contemporary arrangements of both traditional and self penned material. Described as "young, exuberant & musically adept" (R2 Magazine) Georgia's debut album 'The Bird Who Sings Freedom', released on Rootbeat records, earned her a nomination for the BBC Radio 2 Folk Awards last year. An evening of folk tales, haunting melodies and sumptuous harmonies awaits.